Generally speaking, there are two ways to gear up for a trip. The first often requires months of advance planning with the help of Lonely Planet books, Yelp reviews and Google searches (i.e “Top Things To See In “insert city here“). You arrive at your destination with a detailed itinerary in one hand, a printed map in the other, and a head full of expectations on how each day will play out. The second technique, which is the method we used during our recent trip to the Czech Republic, allows the trip to plan itself. Simply pack your bags and…go! Now don’t get us wrong, we often enjoy creating an agenda of things to see and do in a new place we’re visiting, but sometimes it’s just as fun to show up there with no set plans and an open slate. We didn’t do much ground work before landing in Prague but we knew that we could expect to see a city with rich history, beautiful bridges and magnificent castles. 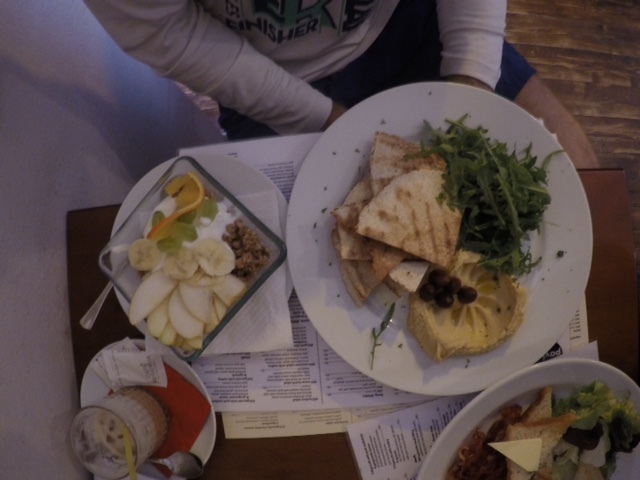 Yet two of our favorite experiences in Prague came as a result of being in the right place at the right time, and having a flexible schedule to accommodate the unexpected! You know those magazines that sit in the seat-back pocket of the airplane seat in front of you? Well, Karen’s decision to pick up and read one really paid dividends for us (what else is there to do when your husband is sleeping?). During our flight to the Czech Republic, she read about the Český pivní festival. What’s that you ask? Why, it’s the Czech Republic’s largest beer festival of course, taking place from May 7-23! For two people who enjoy a cold craft beer, this was a fortunate find. 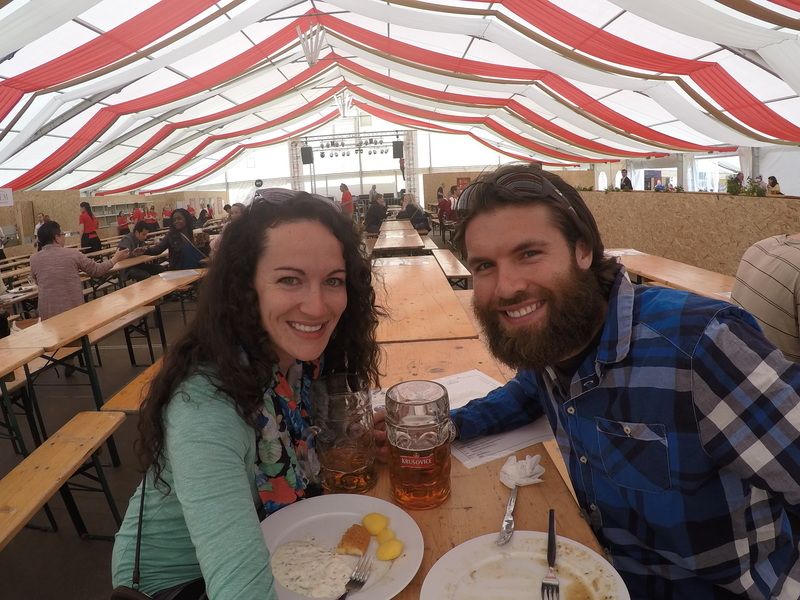 The festival was full of great food, 150 varieties of Czech draft beer, and live music. 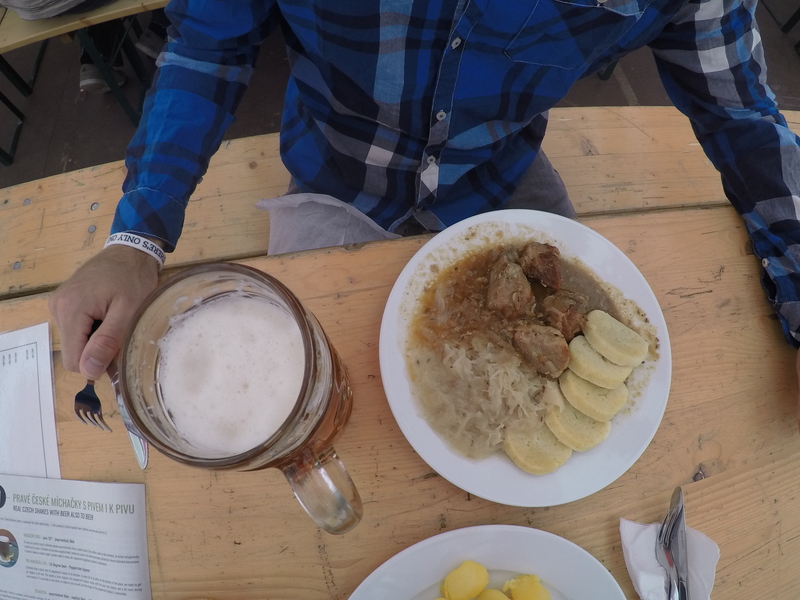 We enjoyed the festival so much the first day that we came back two days later to fill up our steins (and bellies!) once more. Adam’s meal of pork, cabbage, potato dumplings and beer. The second unexpected experience came after noticing advertisements around town for the 2015 IIHF World Ice Hockey Championships. It just so happened that from May 1-17, the games were being held in Prague and Ostrava (another city in the Czech Republic)! 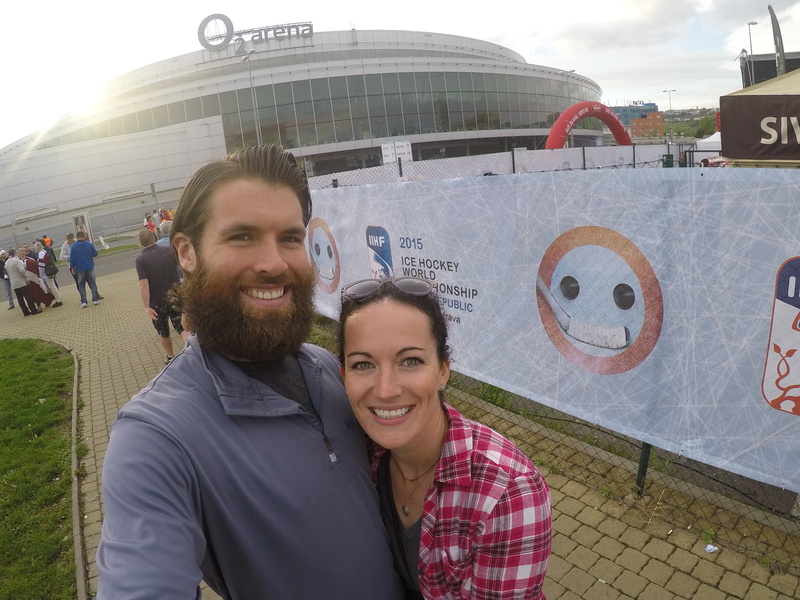 On a whim, we looked for tickets online and decided to watch Latvia take on Switzerland at the O2 Arena in Prague. The atmosphere was electric and it was really interesting to enjoy the game as “non-partisan” bystanders. We had great seats pretty close to the glass, and we were fortunate enough to be surrounded by a group of Latvians, whose team came out victorious (2-1) in overtime! Celebrating Latvia’s victory over Switzerland outside of the O2 Arena. For us, cultural experiences are some of the most exciting and enriching moments when traveling. It’s why we are trying to travel slowly, spending a few weeks in each place whenever possible. Sure, cultural experiences can be planned by doing research and talking with others who have gone before you, but we’ve had the most success when we just let the trip happen and allow the unexpected to occur. The only expectation we have as of late is this: expect the unexpected! What’s your preferred method of planning a trip? Have you ever just showed up to a place with no real plan? Tell us about your experience in the comment section below!